Patients have just had the chance to have a preview of a new £5 million health centre that will transform delivery of services in the Longton area from 2021. Plans were displayed yesterday at a drop in session at St Paul’s Church Hall. The new Longton South Primary Care Centre will provide GP and other primary care services on a large new-build site off Greendock Street in Longton. The new health centre which is NHS funded, will replace two existing GP surgeries – Longton Hall Surgery in Longton Hall Road and the Longton branch of Willow Bank Surgery. The two surgeries currently have 12,000 patients, but the new site will be able to accommodate expected growth in the local area. Practice Manager and Managing Partner Mike Sheldon said: “This is a really exciting development for our patients, for our staff and for NHS services in the south of Stoke-on-Trent. “This will be a truly modern centre that will be efficient and economical to run, meaning we can really spend more on patient services and less on things like heating and maintenance. The Willow Bank, Longton site has already closed after the landlord served notice on the leased building to make way for retail development. 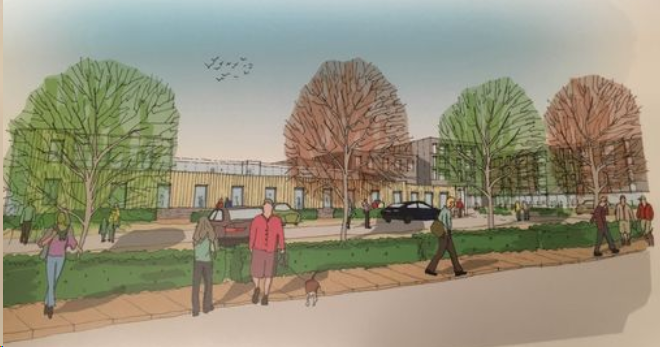 Artist’s impression of the proposed Longton South Primary Care Centre site. The larger health centre means there will also be opportunities to deliver a wider range of services, and it could become a base for more health professionals including specialist Advanced Nurse Practitioners and therapists, and be used for clinical training. The centre could also act as a base for some local voluntary services. Dr Lorna Clarson, Clinical Chair of Stoke-on-Trent CCG said: “We are proud to have secured this investment for primary care in Stoke-on-Trent. General practice and wider community care teams are the heart of healthcare for our patients, and this new build will ensure that these services will be delivered from state-of-the-art premises. It is planned for building work to start on the new site in around 12 months time, if planning permission is secured. This entry was posted in Health, News and tagged Longton, Longton South Primary Care Centre, NHS on 2019-03-20T18:08:34+01:000000003431201903 by NSTV News Team. Regulations have been laid before Parliament to increase certain National Health Service charges in England from 1 April 2019. In the 2015 spending review, the government committed to support the Five Year Forward View with £10 billion investment in real terms by 2020 to 2021 to fund frontline NHS services. Alongside this, the government expects the NHS to deliver £22 billion of efficiency savings to secure the best value from NHS resources and primary care must play its part. This year, therefore, we have increased the prescription charge by 20 pence from £8.80 to £9 for each medicine or appliance dispensed. To ensure that those with the greatest need, and who are not already exempt from the charge, are protected we have frozen the cost of the prescription prepayment certificates (PPC) for another year. The 3-month PPC remains at £29.10 and the cost of the annual PPC will stay at £104. Taken together, this means prescription charge income is expected to rise broadly in line with inflation. This entry was posted in Health, News and tagged Government, NHS on 2019-02-21T13:33:51+01:000000005128201902 by NSTV News Team.